ESCON is currently between funding programs. 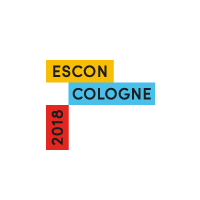 This means that in order to make ESCON 2018 possible, we cannot pay for accommodation. However, we will have only a nominal registration fee; and depending on the additional funding we may acquire, there is a chance that there will be no registration fee and lunch and dinners will be included. Participants are asked to self-organize their accommodation—we strongly advice to make reservations early on as hotels in Cologne fill up quickly.